When Apple release a new iPhone they always intentionally disable features on older devices, making it exclusive to the latest device. An example of this marketing tactic is the Slo-mo feature introduced with iOS 7. 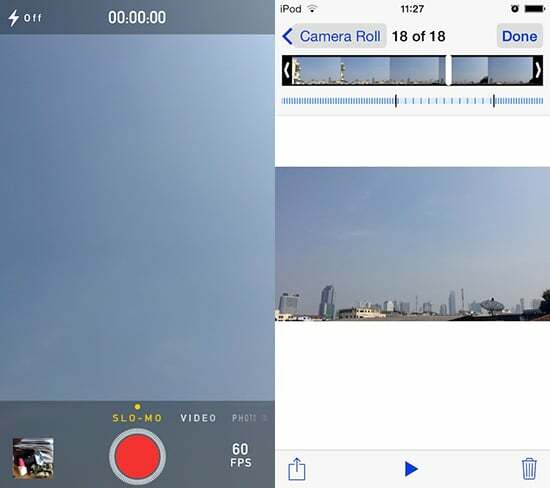 This feature lets you select a portion of recorded videos and slow it down. Although the iPhone 5 and some older iOS 7 devices are capable of this feature, Apple disabled it for those devices. Force Slo-mo editing for all videos. Adjust the slow part of the Slo-mo video volume. Important Note: Tested in iPhone 4S and iPad 2, the maximum slo-mo framerate is up to 30 fps only, else at 60 fps and may not more than this. Also, incorrectly framerate setting causes the camera app to crash. The tweak has some bugs right now with its initial release, but it should be fixed in future updates. Slo-mo Mod is available on Cydia BigBoss repo for free.